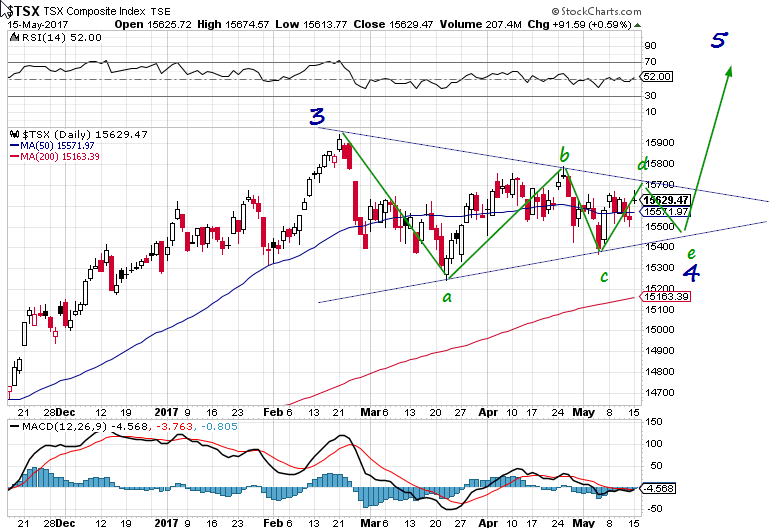 We had this interpretation in our previous blogs, either a series of 4-5s or, more likely, a diagonal triangle 5th wave. This is a long chart and therefore does not lend itself for precise predictions but our take on this is that we are about to peak and that a dramatic drop is straight ahead as that is a “diagonal” which invariable retrace their entire advance. In this case that would amount to roughly a 2/3 loss from whatever peak lies ahead. 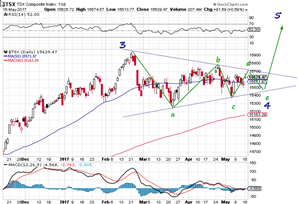 The Dow is going vertical, and if anything, confirms the possibility of a major top. Today’s drop to 15357.24 negates the triangle concept, at least the way it was presented yesterday. Just another 110 points or so and the whole idea can be ruled out completely. 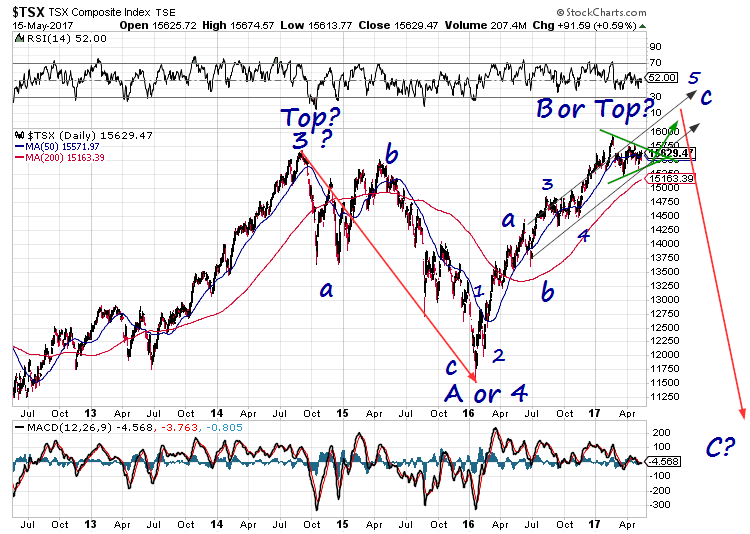 When a triangle does not work, it is often a series of 1-2’s which definitely does not bode well for the near future. Here we have the TSX once again, big and small. We have absolutely no idea where the wave count presently sits over the past decades or more. The only thing that we do note, and this is with some clarity and confidence, is that we have managed to gain roughly 1/2 in just one year coming into the year 2017. We are basically double topping and the market is hesitating to advance further. This is an amazing performance considering that oil is still trading at less than 1/2 of its peak level just a few years ago and Canada’s position in relation to its neighbour to the South is clearly more precarious than it was pre Trump. However the old formula that price= earnings/interest rate is still in play and at its extreme everything is priced at otherwise idiotic levels as interest rates are at, or are approaching zero. So one must remain alert to the possibility of yet another move up. 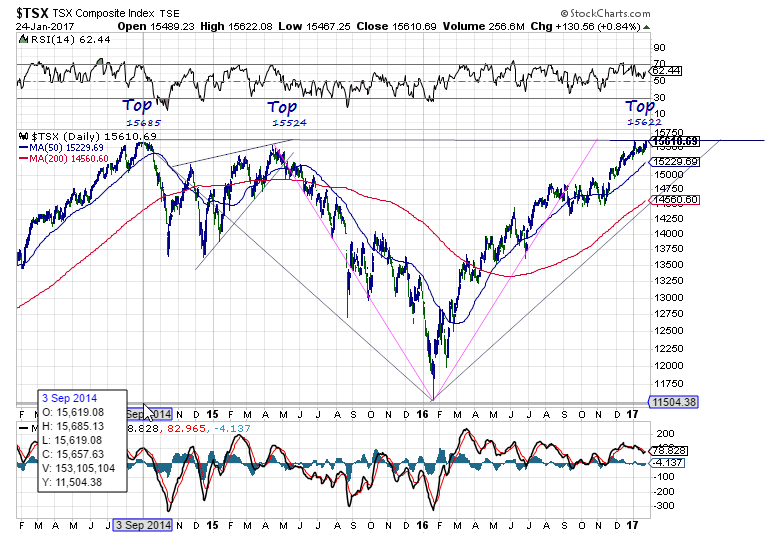 In the shorter term chart there appears to be a distinct possibility of a triangle forming. 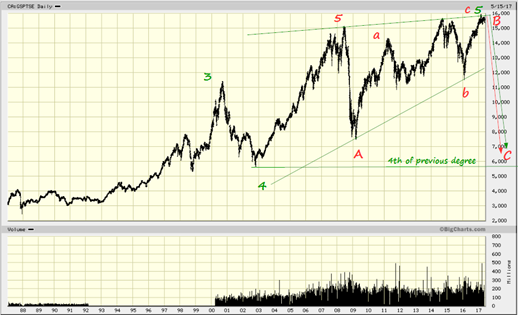 If so we are just about completing wave d of that triangle. 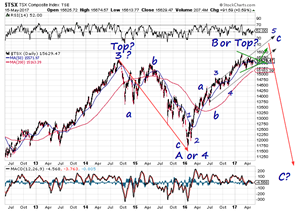 For the purist EW among you, the readers, I point out that wave a can be counted either as a 3-wave structure or a 5-wave one. In the latter case that would negate the triangle! Assuming there is one anyway, the thrust that should start in June should reach roughly 16200 (700 points above the low of e, yet to come). Such a spurt up to that level still leaves open what the upleg from the early 2016 level actually is, a wave B or a wave 5. We show both counts. Fundamentally we cannot imagine what could possible move this market higher again but that has been the case now for years and certainly has not been a good reliable thing to hang your hat on. By the way, do not bet on any of this! We are now within 100 points or less from where we were 2 years and 5 months ago or 1 year and 8 months ago. Oil and Gold are still half in the tank and banks are through the roof. What has changed?